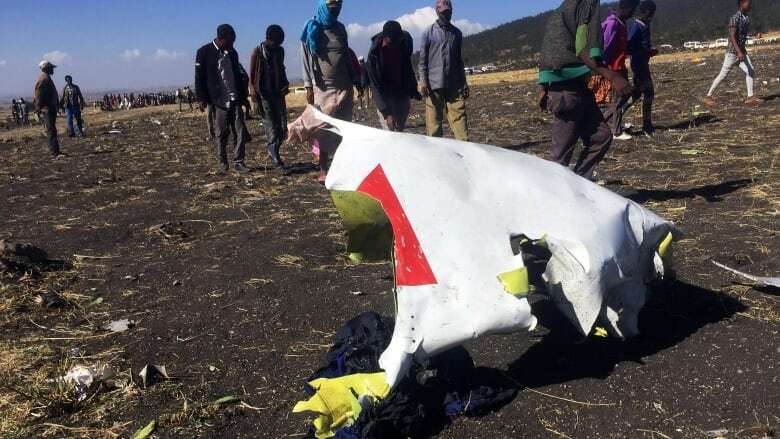 Ethiopians are shocked and distressed by the plane crash that killed 157 people Sunday, according to a freelance journalist close to the crash site. "The mood here is really devastating. Everyone is mourning the incident," said Hadra Ahmed, a reporter in Addis Ababa, Ethiopia's capital city. "It's a gloomy feeling. The radio stations and TV stations, everyone [is] sending out their love ... to everyone who lost their family members and friends and loved ones," she told The Current's guest host Piya Chattopadhyay. The crash scattered plane debris and personal belongings across an area the size of a football field, with a huge crater at the point of impact. "It basically crash landed in a residential area … the residents heard the sound," Ahmed said. "It was very scary for them." There were 18 Canadians on board the Boeing 737 MAX 8 when it crashed, including a Calgary accountant, an Ottawa professor, a Winnipeg woman en route to a United Nations environmental conference and a mother and her young daughter from Edmonton. It is not yet known what caused the plane to crash shortly after take-off, but the tragedy bears similarities to the Lion Air Boeing 737 MAX 8 that crashed in October, killing 189 people. Ethiopian Airlines, along with China and Indonesia, has now grounded all Boeing 737 MAX 8 planes while an investigation is conducted.